O On the evening of 5th of April, 2015, I interviewed Tan Sri Dato' Dr Jegathesan Manikavasagam, about Malaysian Association of Sports Medicine. Tan Sri Dato' Dr M Jegathesan, is widely known as The Flying Doctor for being the fastest man in Asia for winning three gold medals at the Bangkok Asian Games in 1966 and is also the Founding Secretary of the association. Malaysian Association of Sports Medicine (MASM) was formed in 1973 with Tan Sri Dr Abdul Majid bin Ismail as the Founding President and Tan Sri Dato' Dr M Jegathesan as the Founding General Secretary. The other founding members include Prof Dr Chan Onn Leng, (Treasurer) and Dr T. Thinakaran (Assistant General Secretary). MASM took root from the Sports Medicine Consultative Committee (a government link committee) which was formed by Tan Sri Hamzah Abu Samah (the then Minister of Youth and Sports) in 1971. Tan Sri Hamzah requested Tan Sri Dr Abdul Majid (who was the Director General of Health Ministry at that time) to start a resource of Sports Medicine in the country. Tan Sri Dr Abdul Majid, together with several founding members, including Tan Sri Dato' Dr Jegathesan who was then the head of division of bacteriology at the Institute for Medical Research (IMR), Dr Khaw Joo Wah, an orthopedic surgeon, and Datuk Dr J.S. Eapen, Senior Consultant Physician, from General Hospital of Kuala Lumpur sat down put together the beginning of a legacy. To provide support service for the athletes. To assist the Football Association of Malaysia (FAM), and other national sports associations namely in hockey and athletic. To regulate or conduct the sports medical coverage and look after the national teams. 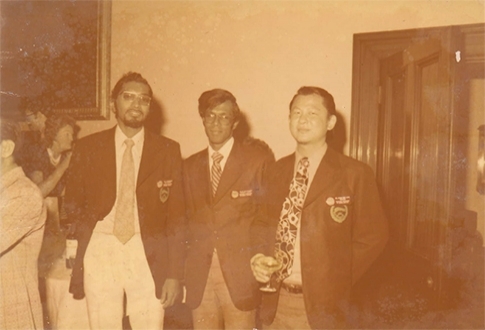 The committee evolved as more members were recruited, and became the Malaysian Association of Sports Medicine in 1973. Doctors from both public and private sectors joined MASM to serve the country. The members voluntarily looked after the national sports teams. Other healthcare professionals could join the Association then as affiliated members only. Over the years, this has evolved and today, non-doctors such as physiotherapists, athletic trainers and sports scientists can be a full and life member of MASM. Malaysian Association of Sports Medicine was also formed to become the national entity that is affiliated to the FIMS (International Federation of Sports Medicine). It is only through this affiliation that our country, via MASM, could participate in activities in Sports Medicine at international level. In other words, this affiliation recognises Malaysia is a part of the family in the International Sports Medicine fraternity. MASM conducted training workshops and seminars plus organised national and international sports medicine events. The association also supported its' members to become team physicians of the respective national and state teams. In the early days, meetings within the Committee members were held in each others' house by rotation. The members were very committed and despite limited resources, managed to organise a number of national and international seminars and workshops on Sports Medicine. The members of MASM even authored a book titled "An Introduction to Sports Medicine". Dr Chan Onn Leong was the Chief Editor. The book was written for coaches and the medical support staff members of a sports team. When I asked what was MASM's best achievements in the early days, Tan Sri Dato' Dr Jegathesan proudly said that MASM had formally established itself as the first organization in the country that put Sports Medicine in its proper place and gave it a proud local standing both in Malaysia and the international fraternity. He is also proud that most of the work they did in the early years of MASM such as the medical coverages and athletes' care were carried out voluntarily and for the nation. I ended up our conversation on that evening with a question, "What is your aspiration for MASM in the future?". Tan Sri Dato' Dr Jegathesan smiled and answered without hesitant, "MASM will institutionalise the presence and practice of Sports Medicine and Science as an unquestioned integral part of the national sports landscape." The writer is an Associate Professor in Sports Medicine, University of Malaya. He currently holds the position of Vice President of MASM.